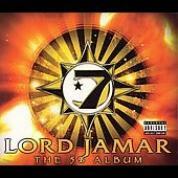 RapReviews.com Feature for June 27, 2006 - Lord Jamar's "The 5% Album"
Let's get this out of the way. 85% of the world is living in the dark, 10% are trying to keep it that way, and 5% see the light and want you to see it too. That's rule number one of fight club. After reading the 90-page informational booklet (!) that accompanies this LP as well as doing a little internet research, I still cannot claim to fully understand the tenets or history of the 5% movement. What is clear to me is that the 5% camp bears a distinct linguistic mark, and if you've heard emcees rap about Gods, Earths, Knowledge of Self and Divine Mathematics you've already been reached by the movement's best word-spreader: hiphop. That probably also means you listen to the Wu, who are all over this LP. To most rap heads, the linguistic incarnation of the 5% philosophy sounds vaguely mystical. The whole thing is about redefinition. Specific letters and numbers have double meanings that go unobserved by the unenlightened. Government names are eschewed in favor of more righteous monikers. In general, 5%-inspired emcees sound like they belong to a secret society that knows what's really real and what's designed to deceive, and though the focus is on living outside the Matrix, 5% rhetoric often suggests its own anti-Illuminati Illuminati. Especially prescient in America, the land that tried to keep black uneducated for as long as possible, is the opportunity the 5% nation extends to blacks that want to become a part of an underground, untouchable intelligentsia. As confused and off-the-rails as they can be, I like that the 5% are intellectual rebels. There's also a lot of universe-speak—5%-influenced dudes rap a lot about suns, moons, stars and planets. Personally, though I don't get down with some of the key 5% beliefs, I've always liked how 5%-styled rappers break the barrier between cosmological metaphor and metaphysical assertion. See the world through the eyes of a 5% adherent and you'll see that things aren't just co-related, they're connected. Accepting some basic connection between Man, Woman, Child, God, World and Universe (and seeing each in the others) begs at least some type of mutual respect and moral reflection. I'm down for that. That said, it is exactly that type of astrophysical philosophizing that lends fairy-tale mythological charm to "The 5% Album." When Lord Jamar and Prodigal Sunn get down on "Same Ole Girl", this album seems like a pretty good idea. Bronze Nazareth does the trad-Wu beat as the two biz-hardened emcees wax poetic about the importance of respect toward women. They elaborate on the drastic depths they're willing to plumb in order to care for and protect the Earths. They rap suns and moons coming together to make stars. They explain that the Earth reflects God onto the Stars. The song is simple, direct, and heartwarming. Grand Puba shows up on "The Corner" to speak on the evils of the streets and the decline of morality. It's a played out topic, but the point is supposed to be that Puba, Jamar, and the other guest emcees don't rap about rebirthing morality from an ivory tower. They still kick it street level. The Puba track introduces another aspect of this album: some of these songs are tight even if divorced from the overtly 5% packaging. A generous portion of 5% thought is centered around not whoring yourself out, preserving your worth, and walking with your head up, and those lessons are aided a million times more by the intrinsic emotion in Puba's windswept delivery than a 90-page instruction book. Likewise on "Deep Space" with RZA, Lord Jamar sounds ill because he's ill, not because he's teaching class. RZA raps about his childhood with real emotion, which he's done many times before to good effect. It becomes clear that the 5% influence on most rappers came in the form of intellectual power. These are dudes that come from grimy places with not a lot of opportunities to flex mental muscle and not get clowned for it, and their encounters with 5% brothers were instrumental in forging their own self-worth. As such, it's much better to hear RZA and Prodigal Sunn rap about the general psychological effects of 5% philosophy than it is to learn about the technical parts of the movement. To that end, Jamar also makes great use of Sadat X and Tahera Earth on "Study Ya Lessons." Sadat X raps, as always, from the heart and you can definitely hear how disciplined study helped him get over things like the death of his father. Tahera drops serious numerical science that I didn't understand a word of, but she makes clear that the study of order breeds order. That's dope. Another highlight is "Young Godz." GZA's kid, Young Justice, supplies the beat, which is a not-half-bad impression of Bronze Nazareth's impression of a contemplative RZA beat. He raps on it too and (sorry to say it) outshines Young Dirty (ODB's kid) and Young Lord (Lord Jamar's kid). The song's concept of young 5% bees rapping together is really nice; it's good to see older emcees training new troops. Young Dirty even copies his dad's drunken-dragon guttural noises! But seriously though, Young Justice is going to be a beast. He just sounds confident from the get-go: "I used to watch Star Wars just to see Yoda/ My thoughts get iller as I get oldah/ A young soldjah since I was pushed in a strollah/ My first days of writin' was with the paint rollah." Tough as it is to say, the philosophical meat and potatoes of "The 5% Album" ("Supreme Mathematics" and "Greatest Story Never Told") don't grab me. Jamar's got a nice hold on telling advanced stories with succinct ease, but these types of songs are just too far outside my beliefs to really hold any meaning for me. Jamar has said that "Greatest Story Never Told" represents his best writing on the album, and by that he must mean that he felt he made his point best. That may be, but as much as I respect the good parts of the 5% movement, I'm not trying to hear rap lectures about the history of Allah Justice and the rest of the original 5% crew. So what we have here in this unusual hiphop statement is, more or less, a Wu-sounding album with a strong focus on respecting women, being strong leaders, learning about and understanding Divine Numbers and Alphabets, and studying revisionist history. It's better than "stay in school, get off the streets" because it's all about taking the new school to the streets, which is more realistic. At the same time, it's a little unclear if all the street school teachers are down with each others' curriculums, so the best way to make sure conciliatory views are being espoused is to stick to the most general tenets. As long as the core of the 5% lifestyle is upheld, I have no problem with it, but it has obviously influenced a lot of my favorite rappers more than it will ever influence me.